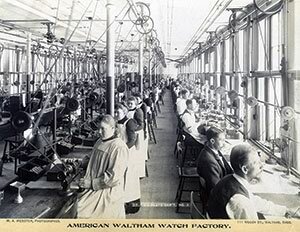 For nearly a century, throngs of area residents of Waltham, Mass., made their way to work in the iconic 1854 factory of the Waltham Watch Company along the Charles River. The first enterprise to produce watches on an assembly line, the company operated in its expansive, 405,000-square-foot facility until 1949, after which a few light industrial and office tenants occupied the buildings. 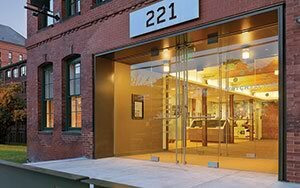 Today, the factory is enjoying a second life, thriving once again through a mixed-use renaissance by Bruner/Cott and Associates (Cambridge, Mass.) that provides innovative living and working spaces in its restored and renovated buildings. 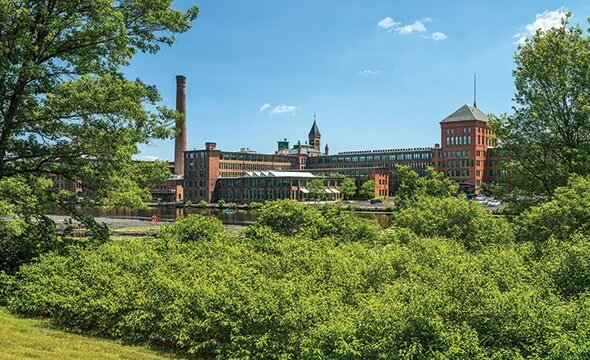 Long-time experts in the restoration, renovation, and adaptive reuse of historically significant buildings and industrial locales, Bruner/Cott recently completed its three-phase, five-year renewal of the seminal factory site. 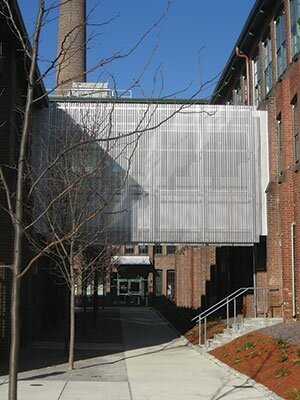 The resulting Watch Factory complex, as it is now known, integrates modern loft apartments and offices with views of landscaped courtyards and the serene river, a small museum showcasing the site’s industrial history, docks at each end of a riverfront park passage, and a public boat-launch to the city’s historic center. Phase I of the project, completed in 2009, covered approximately 1/3 of the complex’s square footage and includes offices, commercial space, and the museum. Phases II and III, completed in 2010 and 2014 respectively – and almost entirely residential – encompassed the remaining space. Phase II added 96 units at moderate rents and spaces for a restaurant and café. Phase III added 67 more units and a parking deck embedded in the sloping site. 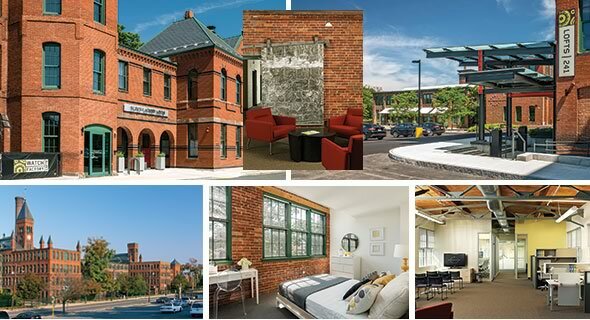 Realized within the guidelines of the Secretary of the Interior’s Standards for Rehabilitating Historic Buildings and approved by the National Park Service, the project marks the firm’s fourteenth conversion of a large industrial complex for changes of use that revitalize their civic roles. The Watch Factory complex possesses integrity of setting, design, materials, workmanship, community appreciation, and historic associations. 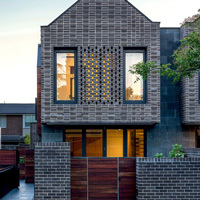 It is significant not only because of its scale and prominent urban setting, but also because of the quality of the architectural masonry in its main elevations, its spatial integrity as an ensemble of courtyards enclosed by semi-transparent mill buildings, and its bold roofline treatments. 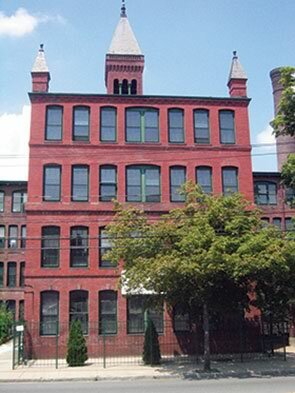 The factory presents a proud frontage for roughly one-quarter mile along Crescent Street, a main Waltham thoroughfare that parallels the river. Comprising a series of five-story brick entrance blocks and elaborate towers that mark the ends of long factory floors, this elevation – built of orange-red brick masonry with narrow mortar joints articulated by brownstone-capped piers – is remarkably consistent architecturally, despite its erratic and idiosyncratic development. The entrance blocks with elaborate roofs (originally taller and even more ornate) are close to the continuous sidewalk, while 200-foot-long factory facades are set back and separated from the street by sloping planes of lawn. Behind the frontage, the facades were constructed less expensively, with rough brick masonry more typical of late 19th century textile mills. 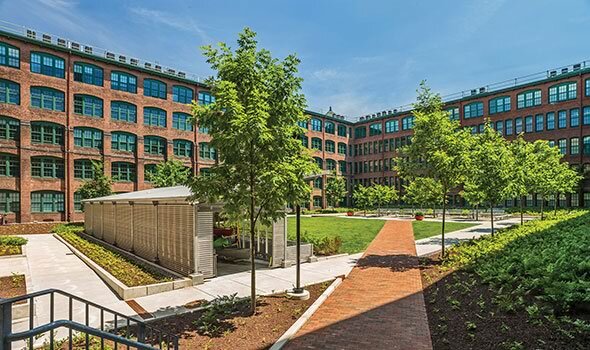 The complex’s street facade conceals a semi-private world of landscaped interior courtyards that open onto an extension of the Riverwalk, a public pedestrian system along the Charles being developed by Berkeley Investments, developer of the Watch Factory project, in collaboration with the Department of Conservation and Recreation. The rear facades of the factory, which create a powerful architectural experience along the waterfront, were built as unpretentious industrial brickwork with six, tall vertical masses dedicated to elevators and other services standing next to the river. The dust-free environment necessary for watchmaking within the buildings led to an ad-hoc approach to their construction that departed from that of the region’s great textile mills and warehouses. Most floors at the Watch Factory are supported by joists and boarded ceilings. Later, upper floors added to existing walls and foundations are sometimes suspended with wrought iron rods from overhead trusses. The earlier buildings next to the river have wood columns, while the later buildings have cast iron versions. Berkeley Investments’ goal for the site’s rehabilitation was to maintain the historic significance and appearance of the complex as much as possible, subject to the review process of the Department of the Interior’s Investment Tax Credit program for Historic Preservation. The design and construction of the project was vast and its execution complicated, in part because the factory’s spaces first evolved through a variety of structural approaches. Preservation aspects of Phase I of the project focused on retaining two buildings along the river and another inside a courtyard that a previous developer had proposed to demolish (with preliminary approval by the National Park Service). Interior spaces were largely left unchanged except for removal of hazardous lead paint on windows and brick walls, and the removal of redundant stairs as well as lead-painted ceilings to reveal the structural timber overhead. Phase II incorporated the original management offices of the complex, and treated windows and many areas of stained and varnished interior millwork as special restoration projects. Phase III carried on the approach to retention with restoration and the display of steel stairs and structural elements established in Phase II. Character-defining elements of all exteriors were treated carefully with interwoven campaigns of repair, restoration, and reconstruction. Meticulous consideration of individual areas of masonry, slate roofing, wood windows, and landscape features minimized replacement and further minimized demolition. Slate roofs were repaired and recovered with matching slates. The most severely soiled areas of brickwork were cleaned and extensively repointed. Brick matches were difficult to achieve, but most were managed with salvaged materials from blocked openings. 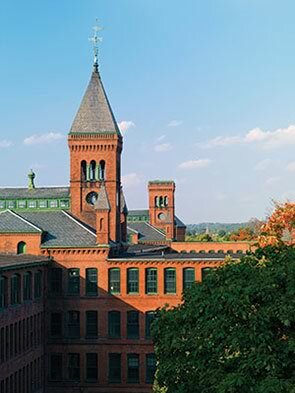 The main entrance to the building was placed at the original headquarters of the Waltham Watch Factory, a building at the leading edge of the complex with more domestic scale than its factory-floor neighbors. The entrance preserves original historic architectural features as it passes through the former headquarters. The main lobby is located in the contiguous factory building and is accessible only to residents and their guests. The interior treatment changes dramatically at this entry point with long passages of vibrant color juxtaposed within corridors and views directed outward toward the trees and courtyards. In the mid-20th century, the impressive 19th century aesthetic of the complex was compromised when the three main Crescent Street entrance blocks were disfigured by the addition of concrete access walkways along both sides, and crude openings were formed to accommodate doors and vestibules. Bruner/Cott removed nearly all of these alterations and also reinstated the brickwork that was demolished when they were built. The original entrance openings were reconstructed, and changes in level were managed to allow for accessible doorways to large main lobbies. These new entrances correspond to those displayed in the factory museum’s mural-sized photographs, which show hundreds of employees coming and going at the change-of-shifts. Connections like these strengthen historical associations with the factory for today’s visitors. Though these individual workers may be long gone, their spirit of industry, innovation, and camaraderie continues to thrive at the renewed complex. The project also is exemplary for its retention of existing windows, original frames, and the management of heat loss with storm windows. The window sashes in the Phase I buildings were replaced with wood replicas in 1980 by a previous owner, but the frames remained intact. 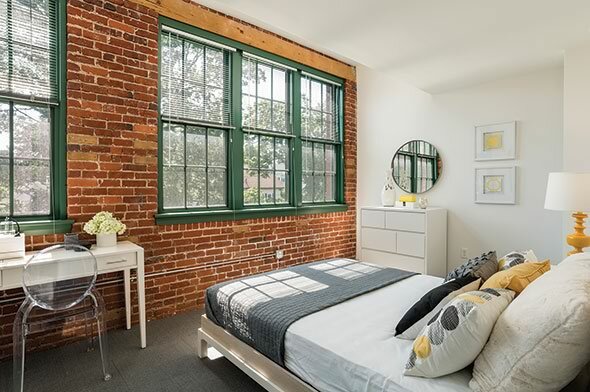 Thermal calculations and pressure-testing for water exclusion helped build confidence that the existing windows with re-conditioned storm windows could approximate the performance of thermally broken aluminum replacements with insulated glazing units. Window treatments in the residential Phase II and III areas differed slightly – because of possible lead poisoning, they were replaced with matching sub-divisions and profiles. 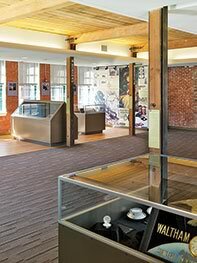 Maximizing space, aesthetics, and value for commercial and residential offerings was critical throughout the project, and the working floors of the main mill buildings presented a unique challenge in this regard. Their enormous windows, designed to flood the interior with natural light to facilitate the watchmakers’ work, were a bonus, occupying a much higher percentage of the buildings’ elevations than the tall, 12/12 sashes of typical textile mills. However, the floor plates of the spaces were quite narrow – just 25 feet outside-to-outside. 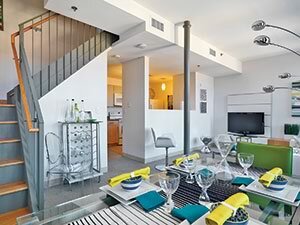 Their tight width demanded creative design solutions that would make the project’s rental apartments function for modern tenants while at the same time developing efficiencies for the whole. Crafting the solution within the project’s proforma was akin to a puzzle that produced distinctive results when completed. 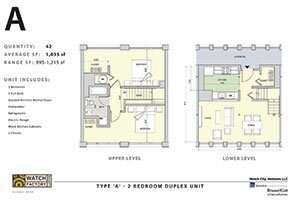 The resulting units, largely duplex, are appealingly singular and enjoy exposed brick window walls and light and views from two or more directions. Skip-stop elevators and a window-lined, single-loaded corridor provide ease of circulation in the residential buildings. Fully rented, there is now a waiting list of potential occupants for the apartment units. To fully realize its laudable rehabilitation goal, Berkeley Investments also financed substantial repair programs to other major features of the factory site that most building owners would avoid. A surviving, centrally located smokestack that dominates the skyline was saved when the company employed specialist steeplejacks to stabilize and repoint large areas of its brickwork, install lightning protection, and emphasize it with architectural lighting. Several blocked freight passages were opened by the design team to allow for public views through the complex into its internal courtyards. 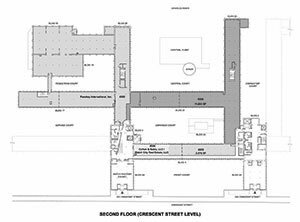 And the extent of building glazing coupled with its narrow floor plates also helps create an extraordinary transparency that sometimes allows views through more than one set of structures, linking Crescent Street to the interior courtyards. 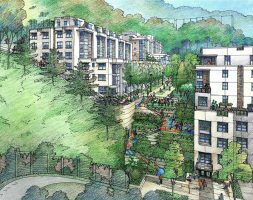 Landscape architecture was a critical element in the Berkeley Investments’ master plan for the project, as well. 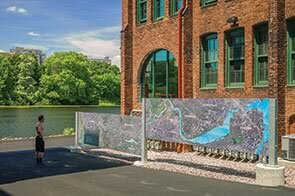 Sustainability is largely addressed through its substantial commitment to stormwater management, critical due to the factory’s waterfront location and dense development. Berkeley and the Bruner/Cott design team worked closely with hydrologists from the Charles River Watershed Association and with environmental engineers from Haley & Aldrich on these systems. The solutions developed for this project provide important models for other historic industrial river frontages. Richard Burck Associates, the project’s landscape architect, garnered the 2014 USGBC Massachusetts Green Innovation Award for its work. Phase I is notable for the surprise and pleasure of its dramatic hidden courtyards, large outdoor rooms that integrate rain gardens with areas of outdoor seating while cleansing airborne pollutants from stormwater. 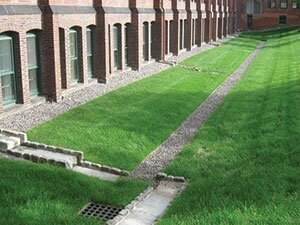 Extensive “horizontal-flow” rain gardens in the courtyards collect, cleanse, and naturally cool stormwater runoff before its release into the river. 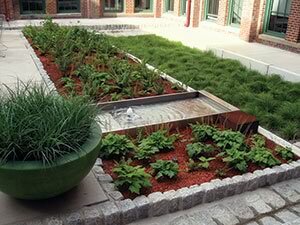 These sustainability features are indistinguishable from their other function as visually ordered planting beds. This approach extends to Phase II, where the courtyards are less corporate in feeling. 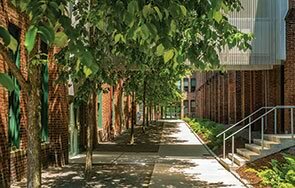 The Phase II apartments surround a vast internal courtyard with elm trees flanking walkways from two gated entry portals to building entrances. Flowering trees weave through a paved gathering space. Portal locations favor residents who use the Riverwalk to make their way to the commuter rail station and to the cinema and restaurants along nearby Moody Street. The project team saved a 150-year old Red Oak tree, a mature Maple, and a Chestnut in an open courtyard that adjoins the restaurant and a café space. The second, fully enclosed courtyard contains a sleek storage shed for residents’ kayaks and bicycles as part of its architectural and landscape solution. Intrusive shrubs and unhealthy trees in the sloping lawns along Crescent Street were removed to restore their spatial clarity, and new blight-resistant elms were located to emphasize the entrance blocks. Paving and plant choices create a balance between the industrial interior of the site and its more civic and institutional street frontage. 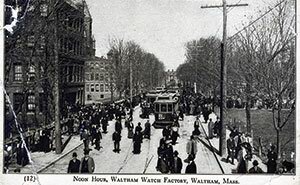 The Waltham Watch site now offers a meaningful and tangible connection to the city’s unique history. 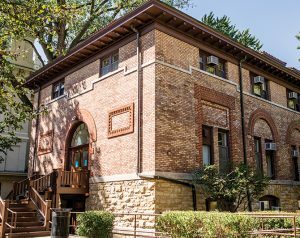 Despite a legacy of improvisational building and questionable subsequent interventions, Bruner/Cott’s redevelopment work has successfully created a useable historic site with many community benefits. More than 160 apartments were added to the city’s housing stock – all in adapted historic industrial space. Offices in the central group of linked buildings house more than 20 private employers, significantly contributing to the local economy. Perhaps most importantly, the Watch Factory complex now can be experienced by the public within the context of the urban landscape. A supportive developer, consultants and engineers, sustainability and landscape experts, along with Bruner/Cott’s coordinated design efforts with local and national placemaking organizations, have paid off abundantly in the form of a cohesive urban vision. The richness of the Waltham Watch Company’s past and the material and spatial assets it left behind now unfold through new ways to live and work within its venerable walls. 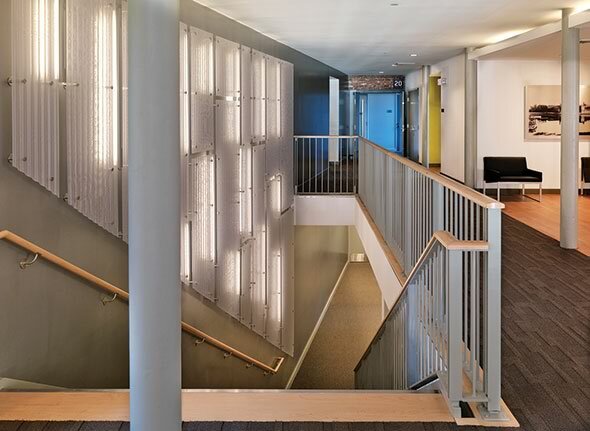 Henry Moss, AIA, LEED, is a principal with Bruner/Cott & Associates in Cambridge, Mass.